Oisin O'Neill celebrates a goal against Derry for Armagh during the Ulster U21 Championship last year. THE good news for Armagh supporters is that Oisin O'Neill is aiming to return to county football – but the bad news is that he's not thinking of that until next year. 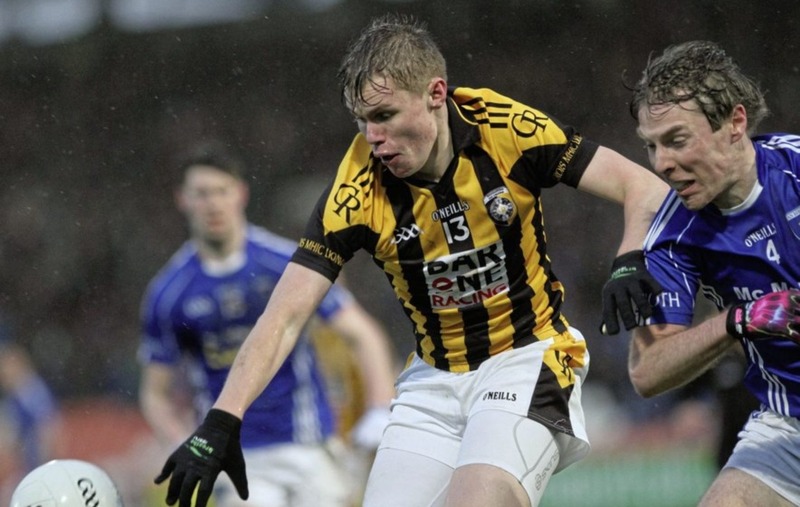 The other bad news for most in the county is that he's also optimistic that his club Crossmaglen will be back too, as senior champions, after failing to win the Armagh crown over the past two seasons. 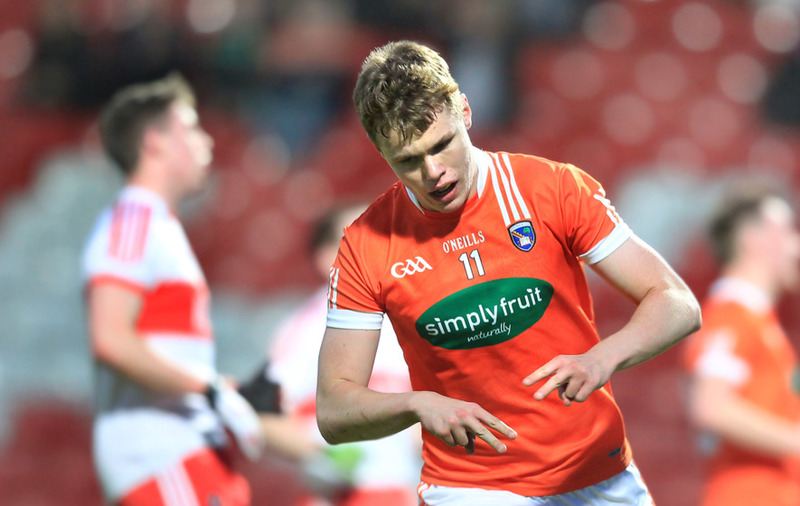 Having just turned 21 last Friday, O'Neill insists he won't be involved with Armagh seniors this year, instead focussing on getting himself fully fit and injury-free. "Last year from January to April I played 21 or 22 games, between Sigerson, U21s with club and county, and then the McKenna Cup and National League. "To be honest, come Championship time I was struggling with injuries. In the last game of the League I pulled my groin. I was trying to come back from that, but any time I went to run I kept hurting my Achilles [tendon]." The young midfielder/ forward did play a part in five of Armagh's six Championship game last summer, mostly off the bench, but felt that he wasn't at his best due to those injury issues. "So this year I'm just trying to focus on getting my body right and stronger, so that, come next year, touch wood, I can get back into the Armagh set-up next year. 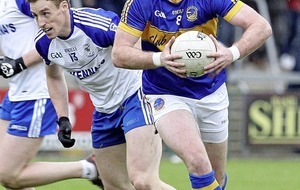 I'll be stronger and ready to play county football." Asked about the prospects of a return this season, he said: "At the minute I've had no contact from anyone in the Armagh camp, so I couldn't see it, no." O'Neill is impressively determined to do what he feels is right for himself. As another example, he left Queen's, where he was studying Business Management, because "it just wasn't for me. "I was in Queen's for a year. I just wasn't enjoying my time in Queen's. I always wanted to do teaching, I thought I'd do a degree first then do a PGCE, but then I decided to do full teaching." 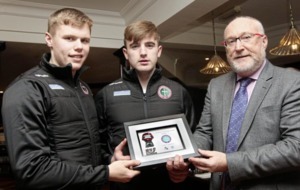 He switched to St Mary's, training to be a secondary teacher with business and IT, and helped them win the Sigerson Cup last year, although they lost their hold on the trophy against local rivals Ulster University last week. A desire to do well with his club Crossmaglen may also be an element in stepping away from Armagh involvement. "The thing about Cross' is we're kind of at a crossroads – we've a lot of young players. We won four [Armagh] Minors and two U21 championships [in recent years] and it's just taking a bit of time for some of the young players to bed in and find their feet. "We've been quite unlucky with injuries too. Two years ago we lost James Morgan, last year we lost Tony Kernan – if you take those sort of players out of any club team in Ireland they're going to struggle. "We still have a lot of quality coming through. Our U16s were in an Ulster Final, our U21s are in the Ulster U21 championship, so we still have that quality coming through, which is really positive. "Donal's back in charge and we also have Kieran Donnelly and Francis Fitzpatrick, who were over the minor teams and one of the U21 teams, so they know all the young fellas coming through. So there's real continuity there, they know us well, and we can build for the future".